Soap box car racing was a popular pastime for American youth. The cars were usually made from scrap materials such as crates and baby buggy wheels, and only needed a steep hill and a skilled driver to race. In 1933, a photographer from the Dayton Daily News in Ohio organized a formal soap box race. 362 racers competed in a competition that attracted over 40,000 spectators. After the success of this event, newspapers all over the country began sponsoring soap box derbies. The first All-American Soap Box Derby was held in Dayton in 1934, with 34 cities sending their local champions to the event. In 1936, the Works Progress Administration, a depression-era work program, converted a ski-run in Akron, Ohio into Derby Downs, the permanent home for the All-American Soap Box Derby. This soap box car participated in the 35th national championship in 1972, and was built and piloted by Clint Buckley of Winchester. 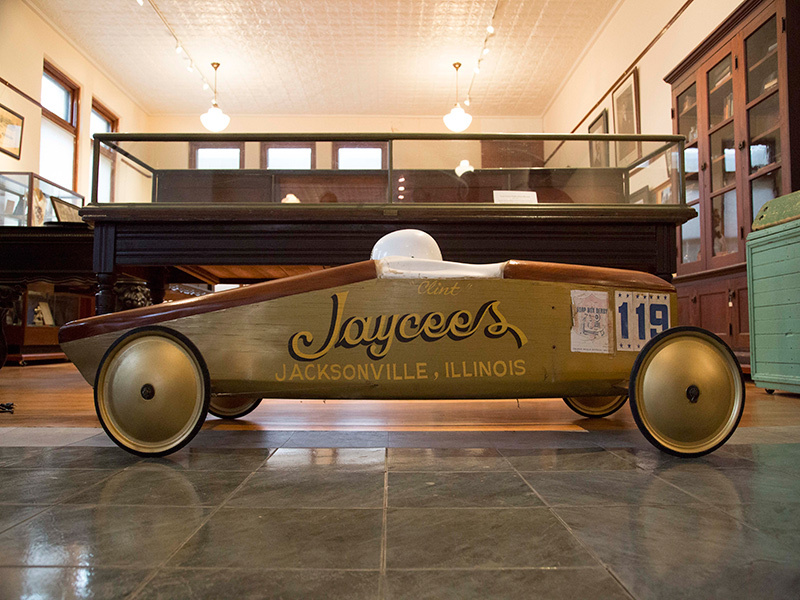 He won the the Jaycee Soap Box Derby in Jacksonville to qualify for the race. His sister, Anita Buckley, was the first girl to race in the Jacksonville event in 1974. Today, Soap Box races are held all over the world and the Soap Box Derby Championship welcomes almost 500 contestants.